Will We Have to Leave Europe? The European Union isn’t the same as the continent of Europe. It is a group of countries within the continent, who work together. Every country pays money into the EU and in return receives certain benefits and payments. After World War II, the countries of Europe came together with the aim of preventing further wars. The six founding countries are Belgium, France, Germany, Italy, Luxembourg and the Netherlands. Over time more countries joined, with UK voting to become part of EU in 1973. So we won’t leave the continent of Europe, just the European Union. Why was the Referendum Called? Not everyone is a fan of the EU. Some felt that the UK would be better working alone, as an independent nation. They thought that it would be better if the UK was able to create laws and negotiate with other countries without taking the other European countries into consideration, or having to accept policies that UK didn’t agree with. To enable ordinary people to give their opinion, Prime Minister David Cameron called for a referendum to be held. He was against leaving the EU, and thought that the country was stronger within the European community. 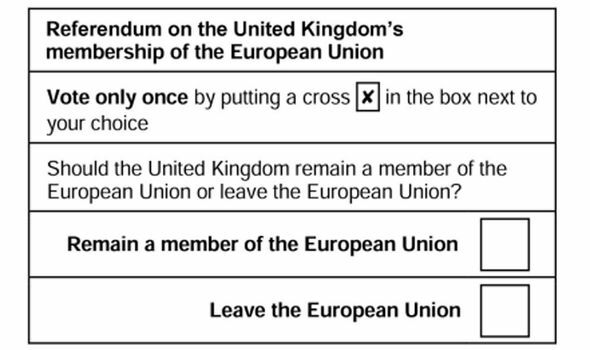 Everyone in UK who was eligible to vote went to Polling Stations yesterday and marked their ballot papers, which asked – do you wish to leave the EU or do you prefer to remain in the EU. Right now, no one can say for certain what happens next, which may sound a bit scary, but for the first weeks and months, you won’t notice many changes in your life. The referendum doesn’t mean that we leave the EU right away. For that to happen, our politicians have to trigger something called Article 50. This sets out the framework for any country to leave the EU; it doesn’t happen automatically. Until this is set in motion, everything stays the same. Once that happens, the UK still has two years to make arrangements with the European Union, and the negotiations of all the nitty-gritty legal questions will take even longer than that. On the day after a vote for Brexit, the UK will still be a member state of the EU. All the legislation which gives effect to EU law will still be in place. Nothing as a matter of law changes in any way just because of a vote to Leave. The referendum was an advisory one, not a mandatory one. This means that in theory, the UK government could have ignored the result and carried on as normal, although this would be thoroughly undemocratic. The people have voted, and it wouldn’t be fair or right to ignore their opinion. Even those who don’t agree with the result will have to accept it, and work together – it’s a time for politicians to knuckle down and sort things out! What Happened to our Prime Minister? Prime Minister David Cameron resigned after the results of the referendum were announced. The new Prime Minister is Theresa May. She will now work with her ministers to decide on how to move forward with exiting the EU. Was Brexit Blocked by the Court? In early November, you might have heard about a court case brought by some citizens of UK. Basically they asked the court to rule on the legality of the government serving Article 50 without first consulting parliament. Some people thought that the judges had no right to rule on this, but the law is very clear. Referendums in the UK are not legally binding. They are advisory, which means they signal to the government what the majority of the people who voted want. The court decided that because parliament had not stated that the government could go ahead and trigger Article 50, the government must first present their plans to parliament and allow a vote. The government disagrees with that decision and is going to ask a higher court to review it. The judges of our country are independent. They aren’t elected by the people because we don’t want them to try and be popular. If judges were chosen by voters, then it would be difficult for the judges to uphold unpopular laws because they’d worry they wouldn’t be re-elected at the next election. Why Can We Never Go Back? This question was sent from 8-year-old Chris, who wants to know why we can’t go back. We live in a democracy, which is what we call it when everyone who lives in the country helps to decide on how the country is run. It would be impractical to ask everyone in the country every time something had to be decided, so we elect representatives to parliament. These politicians will now have to work together with the European Union, to ensure that the voices of their constituents (the people who voted for them) are heard. They can’t ignore the votes of the majority, as that would be undemocratic. They can’t go back, they can only go forward and work hard to get the best deal for our country. It is expected that the economy will be a bit wobbly for a while, and if you go to Europe on holiday you won’t get as many Euros for your £. When we go to Europe, we change our British money into € to spend there. In the coming years, it may be that UK citizens will require permission to visit European countries, in the form of a visa, but this summer’s holiday won’t be affected. Will My Friend Have to Leave the Country? If you have a friend from Europe, then you may be worried about them. As mentioned, the vote doesn’t mean that UK must leave the EU immediately. There will be a long period of adjustment and negotiations, and that will include agreements on immigration. European citizens may have to apply for permission to live and work in UK in the future, but your friend won’t be disappearing from your life overnight. How Can I tell Kuba That I’m Still His Friend When Adults Don’t Want Him Here? This question was sent to us from 6-year-old Theo, but we’ve seen variations of it from several children today. Theo, I’m not going to lie. There are people who think this. People who are worried about their own situation, or are unhappy with their lives, and who look for someone to blame. Often the people they blame are those who are different from them. Maybe their skin is darker, or they have a different religion. Their food, customs and traditions are unfamiliar, or perhaps they speak a foreign language. The important thing to remember, Theo, is that these people are not all British people. Not every voter who wanted the UK to leave the EU thinks this. Million of British people voted to stay in EU and to welcome migrants into our country, into our homes, and into our hearts. What can you say to Kuba? You can tell him that you have more in common with him than you do with the people who don’t want him and his family to stay. You can promise to defend him if anyone is mean to him. You can tell him that you love him and his family and that you’ll always be friends. Will I Still Have to Learn French? Yes, you will, and other languages too if you want. Now more than ever, it is going to be really helpful when a lot of British people speak foreign languages. We will still trade with Europe (buy and sell goods and services), and we’ll still go on holiday there. How Will it Affect Me Going to University? That’s a tricky question and one that isn’t easy to answer. UK universities have benefited from European research funding, and from tutorial payments from foreign students who have come to the UK to study. The Universities UK, a group that represents institutes of further education in the UK, have said they will work with the UK government to ‘convince the UK Government to take steps to ensure that staff and students from EU countries can continue to work and study at British universities in the long term’. Short term, as stated above, this won’t affect students. Long-term it may mean that the loss of research funding will lead to an increase in course fees to cover the shortfall. Which doesn’t mean that you won’t be able to go to university, so keep up the good work in school! Please do not worry if you have a friend from Europe. He will be just fine. He will be worrying about you and your country. This is a really clear and helpful post both for parents unsure of how to explain the EU Referendum result to their children and the children themselves. I haven’t even broached the subject with my 4 year old, but that doesn’t mean that I won’t… as he starts to understand more about the world around him I shall be looking for ways to explain things clearly to him in ways he can understand and posts like this will be so helpful in that. So thank you. Will we gain or lose goverment money from the decision of leaving? Thanks for your question, Ben. I can’t answer it right now, and I suspect no one can, but I’ll ask some experts if they have any more information and come back to you soon.